Within Teamwork Desk you can choose to enable Gravatar avatars for your customer icons. Gravatar is a profile image that follows users from site to site appearing beside their names. Note: If a customer contacts you and they are using Gravatar then their Gravatar icon will show, if a customer contacts and they do not have Gravatar then a default Desk icon will show. To enable this on Desk, click on your profile image to the far right of the Desk navigation bar and select Settings. 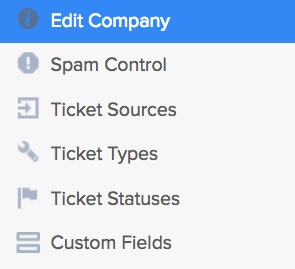 Choose edit company within the left pane. You will now have the options to choose the Default customer avatar. Note: In order for a customers Gravatar image to show they will have to sign up to Teamwork Desk using the same email they used with Gravatar.